With or Without You now takes its place in my top ten most memorable books of all time. Even a day later, I can't shake the full bevy of emotions that I've been feeling since I finished the book. What Brian Farrey has done is craft a story that is so real, so raw, that it is almost too tough to read. He deals with subject matter that most writers are afraid to tackle, and does so with utter finesse. I am in love with this book. Gushing aside, I'll do my best to explain to you what makes this such a fantastic read. First are the characters. Evan, Davis, Shan, Erik, every single one of these characters so wonderfully different. Their personalities shine off the page, and they are likable and believable. What I loved most was how Farrey bares their souls to the reader. For instance, when you see Evan, you don't just see a boy who is gay. You don't just see a boy who is a confused adolescent. Rather you see every single element that is Evan. From his love of painting, to his need to please those around him, right down to his utter and total love for his friend Davis, it's all there in vivid color. I think that is the reason why this book is so beautiful. There isn't any shade up between the reader and the characters. Evan is flawed, and it shows. Then there are the relationships in the book. 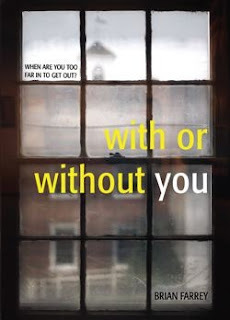 Rather than just dealing with the boyfriend relationship between Evan and Erik, With or Without You tackles so much more. We are allowed to see the friendship between Evan and Davis that seems so strong, but isn't as strong as they really think. There is the relationship between Evan and his parents that is tense, but loving in a very hidden way. Then there is the friendship/rivalry between Evan and his sister Shan. Each one of these is different and intriguing. It makes this story so multifaceted and, well, fascinating! Exploring each of these with Evan is what makes this book come alive. Before I gush too much, or give too much away, I'll quickly tackle story line. Brian Farrey exhibits his talent as a writer by creating a story that will draw you in without you even realizing it. Evan is introduced to the reader and then, like rose petals, the different facets of his life are slowly pulled away and bit by bit more underneath is revealed. Evan's life unfolds in a gorgeous and raw manner, and you begin to see that everyone out there is not what they seem on the outside. Farrey shows us that we all have something we are hiding on the inside, some deep seeded secret, and in order to grow we need to face it and let it go. It isn't very often that I find a book that so wholly draws me in that I forget to eat before going to work. If you think I'm kidding, I'm not. I was so immersed in With or Without You that I literally had to squeeze out every moment of available time before work so I could get to the last page. This book is, in a word, amazing. Raw, unnerving and beautiful, I am completely in love.